Because your success depends on more than just a platform. Let Net-Results automatically engage your prospects for you, so you can focus on strategy and creativity. Always have your data in front of you. Stop guessing what works – know what works. Integrate with your favorite CRM and show exactly what marketing contributed to the bottom line. Net-Results employs a proven process to ensure your success with marketing automation. Free 14-day trial + expert onboarding before you sign anything. Our unlimited support does not stop after the initial onboarding. Schedule 30, 60, or 90 minute discussions at will. Review nurture campaign plans, onboard new team members… We’re here to help. Complete, and constantly updated, knowledge base. If your issue requires deep magic for your tech team, Net-Results brings the engineering power to the table, no additional charge. Email Support Prefer to write us? We track our response times weekly. Our average time? Less than one business hour. You’ll speak with a marketing automation expert in a no-pressure conversation. Responsive design is baked in. Gorgeous templates make looking great a breeze. Personalize messaging across your customer journeys and generate more opportunities. Deploy communication streams quickly and adjust at will. Lose the handcuffs. Leverage behavioral, demographic, and firmographic data without limits. Built-in integrations with Salesforce, Dynamics 365, & SugarCRM. 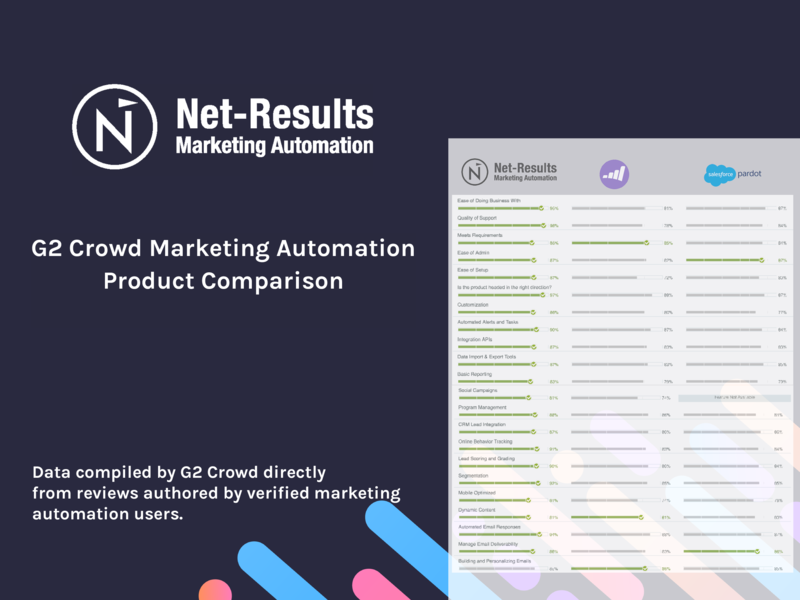 Exclusive 30 Minute Setup is why G2 Crowd data shows Net-Results delivers the fastest time to ROI. Clear views help you understand what’s working and where to focus your efforts. Net-Results is big enough to deliver a fantastic platform and small enough that you’ll never doubt that you and your needs matter. A self-funded company since our inception in 2003, we’re driven to build long-term relationships by exceeding your expectations. Unlimited, top-rated training and support. Net-Results is a G2 Crowd industry leader in customer support. All our customers get all the support they need, at no extra charge. A marketing automation platform you'll actually use. An intuitive interface where everything works the way you expect it to work. You’ll be live within the first month, not the first year. No hidden costs, no add-ons. Get the full Net-Results platform, including integrations, sales users, all functionality and top-rated support, always.